Cauliflower rice has been popular for quite some time, but it wasn’t until I learned how easy it was to make your own cauliflower rice that I fully embraced it. I mean, why in the world would I pay $2.50 for a small bag of cauliflower rice – knowing FULL WELL that I’d need 2-3 bags for just one dinner – when I could pay the same price for a full head of cauliflower and make my own?! I mean, I’m saving 66% right off the bat by doing it myself! Well friends, the deal just got better, because today I’m showing you how to FREEZE cauliflower rice. That way you can stock up when it’s on sale, save a ton of money AND save yourself time later on by having it ready to go in the freezer! This should go without saying, but before you can FREEZE cauliflower rice, you need to MAKE cauliflower rice. And before you MAKE cauliflower rice, you need to BUY cauliflower. Or grow your own. Your call. In either case, you don’t need special cauliflower to make and freeze cauliflower rice. You can start with a whole head OR you can start with pre-cut cauliflower florets. Pick whichever is on sale or available in your area. Tip: Whole heads will be cheaper in most instances, but when they’re priced per pound, weigh each head so you know how much you’re actually going to pay. They’re surprisingly heavy! Then you can better compare the price of the whole head of cauliflower versus the pre-cut florets. As I explained in my how to make cauliflower rice post, there are a few ways to go about making cauliflower rice. Before you start though, make sure you wash your cauliflower using the natural produce wash option that works best for you. You can use a knife and cutting board. No special tools required! 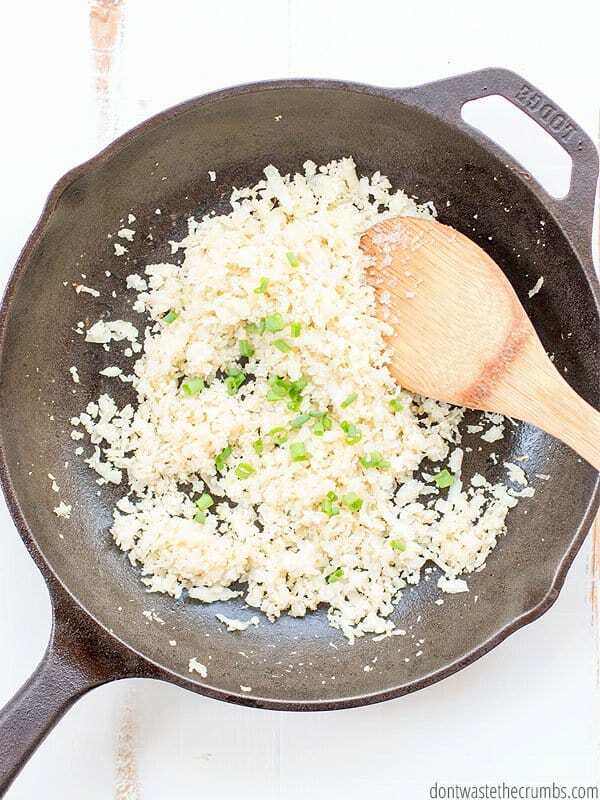 You can go old school and use a knife and cutting board to make cauliflower rice. It’s a bit tedious and time consuming and messy (heads up), but it CAN be done. You can use a box grater. 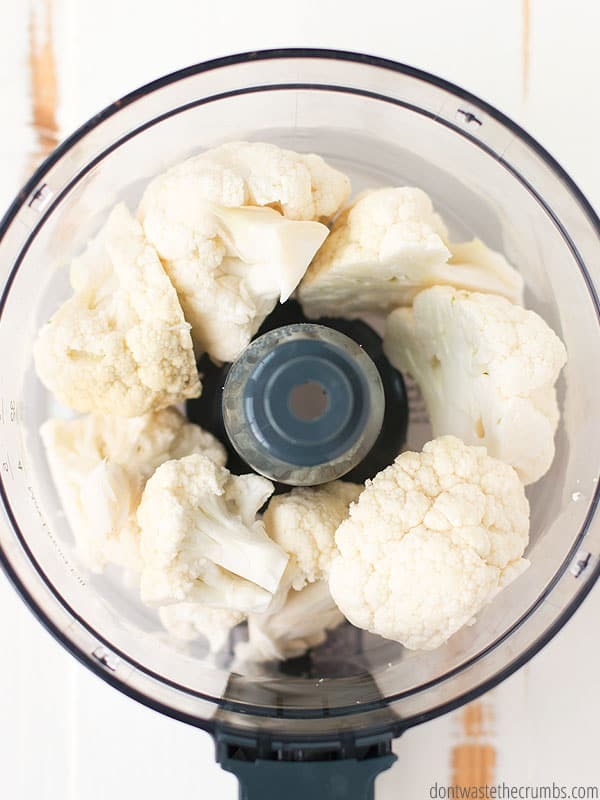 I haven’t personally tried this method myself, but according to this blogger, you can put chopped cauliflower in a blender, fill it to the max fill line with water, and hit pulse until you have crumbles. 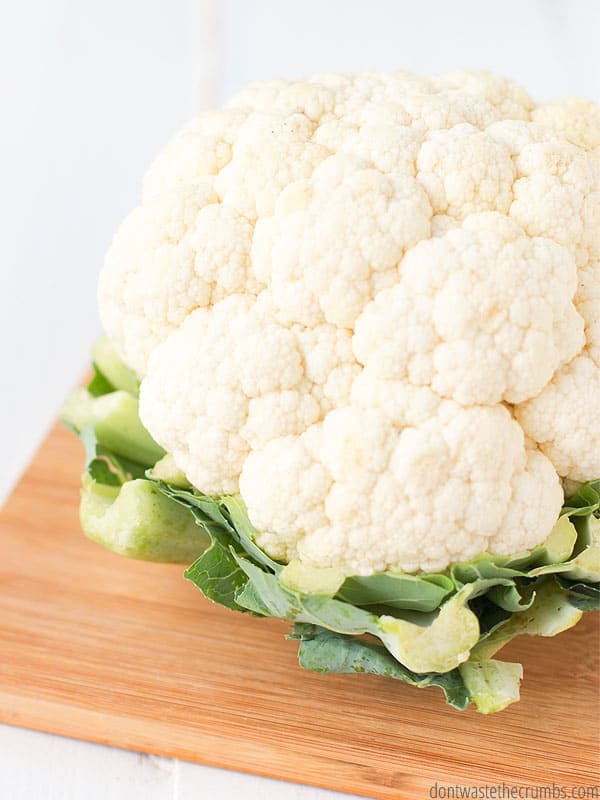 Drain the cauliflower in a colander like this one and BOOM – cauliflower rice. I have this Blendtec blender and honestly, I think this method might accidentally give me a cauliflower sauce (which is TASTY on pasta primavera). If you try it though, leave me a comment below and let me know how it goes, mkay? Use the plate with the large-hole grater and feed the food processor cauliflower florets. Stop when you run out of florets. Done! Okay, now that you have cauliflower rice, let’s freeze it! Step 1: Make sure your rice is completely dry. This probably isn’t an issue if you used a knife, box grater or food processor. 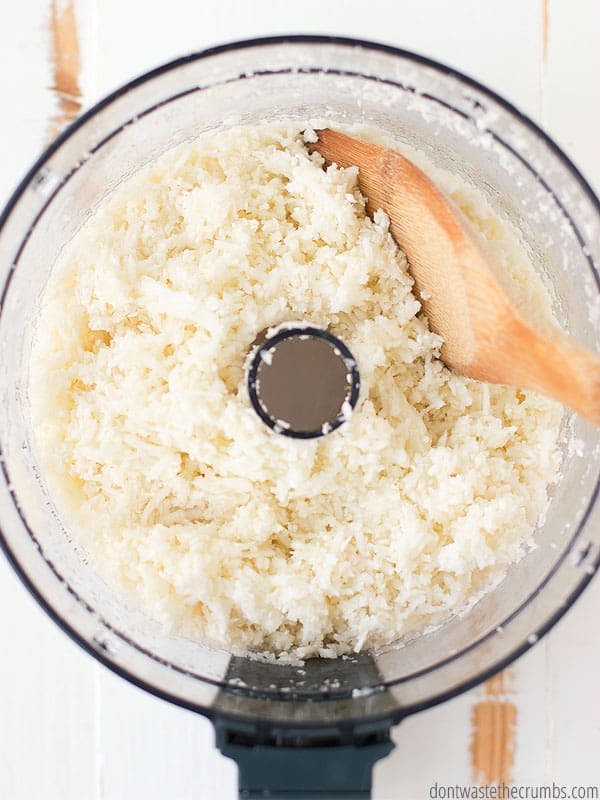 If you used the blender method, make sure your cauliflower rice is super dry. I like to use my DIY salad spinner method to get out all the excess water. Step 2: Determine the portions of rice. This might not seem like a big deal, but it is. You want to make sure that when you thaw the cauliflower rice later on, you’re thawing enough for dinner and maybe a leftover lunch… but you don’t want to thaw too much… especially if your family isn’t keen on eating leftovers. For my family of four, I freezer cauliflower rice 4 cups at a time and odds are there’s just enough leftovers for one lunch. 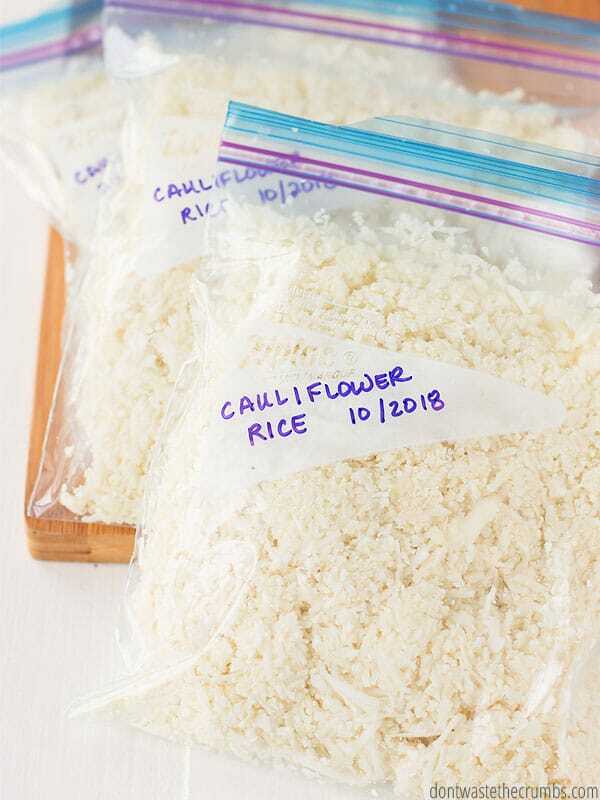 If you’re not sure how much cauliflower rice to freeze in one package, I recommend allotting ½ cup per person if it’s a side dish, or 1 cup per person if it’s a main element (like Korean beef bowls or slow cooker beef ragu). Step 3: Portion out the cauliflower rice. Guess what friends – you can go straight from cauliflower rice to the freezer WITHOUT cooking it first! That’s good news to this mama, because I certainly don’t have the energy to COOK several heads of cauliflower rice once I’ve finally finishing chopping it all up, LOL! Using freezer-safe containers (I use resealable plastic bags), portion your rice for the freezer. Four cups of cauliflower rice just fits into one quart baggies. Two cups will fit in a sandwich baggie. If you’re working solo, I highly recommend these baggie holders so you can get the cauliflower rice into the bags without making a huge mess all over the place. They’re inexpensive and TRULY a life saver! Step 4: Get all the air out of the bag. You want to avoid freezer burn, so make sure you get as much air out of the bag as possible. Step 5: Label the bag. You’ve probably heard me say this a thousand times when I showed you how to freeze tomato paste and how to freeze pizza dough and how to freeze ginger and how to freezer herbs and how to freeze yogurt and how to freeze bread, but make sure you label your bag. In the case of freezing cauliflower rice, you want to write what it is, how much there is, and the date you prepared it. Do NOT blindly toss a full bag of cauliflower rice in the freezer and think you’ll know what it is later. Because you won’t. Trust me on this one. Step 6: Freeze the cauliflower rice! When your bags are full and labeled, toss them in the freezer! I like to freeze them flat and stacked on top of each other for the first day. That way they can be re-arranged into a “bookshelf” of sorts later on. Storing items like a bookshelf is one of the most efficient ways to use freezer space, plus it makes it easier to find later on! I would be a poor teacher if I didn’t tell you that if you’re going to make and freeze cauliflower rice, it’s worth your time to do several heads of cauliflower at one time. You’ll make a mess once, clean it up once, and you’ll have tons of cauliflower rice in the freezer for whenever you need it! You’ll use your frozen cauliflower rice just like you would fresh cauliflower rice in any recipe. It might take a minute or two longer to cook, but not much because the rice is so small and will cook quickly! 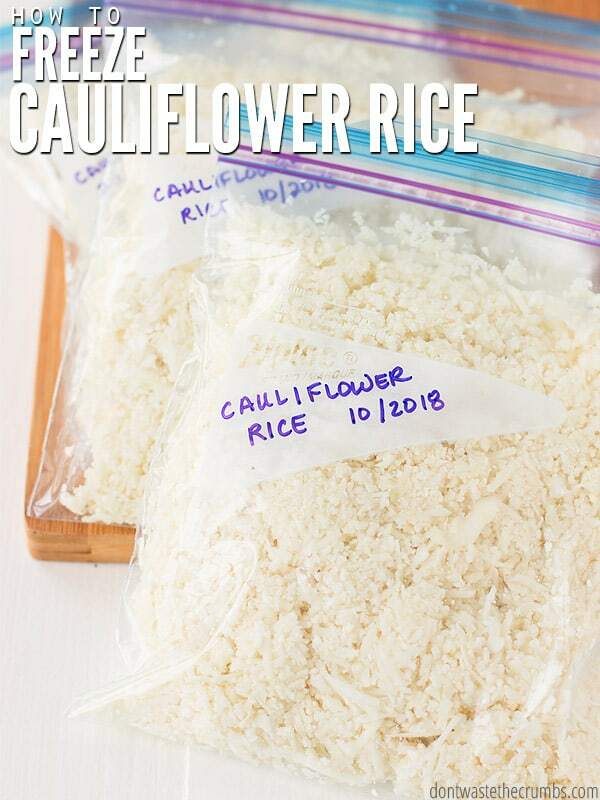 Do you make your own cauliflower rice? 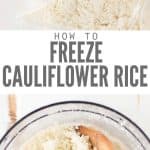 Do you freezer cauliflower rice? Share your methods in the comments below!